I’ve talked about my family many, many times on here, so if you’ve read for any length of time, you may have discerned that I have two pretty fantastic younger brothers. Even though they are most definitely adults, I will always think of them as my baby brothers. As much as I adore them now, it wasn’t always so. They are very close in age to each other, but several years younger than me. Add to that the fact that they were both 1000% boy and it probably wouldn’t surprise you to know that things weren’t always peachy growing up with them. Our dad aptly described it many times as “like raising wild dogs.” Every chance I had, I would beg my mom for a younger sister. She was at the top of my Christmas list many years in a row. Eventually I resigned myself to the fact that I would not be getting a sister. Any older sister is bound to be protective of her younger brothers, but when Mom passed away and we were all still so young, it definitely added another dimension to my worries. As they grew out of the “wild dog” phase and into the “teenage boy reeking of Axe” stage, I began to worry specifically about the girls they would date. I was generally glad that they didn’t seem overly preoccupied with girls, and that Davy never seemed to have an official girlfriend. Finally around Davy’s senior year of high school I caught wind of a girl in his life – Rebekah. I remember the first time I met her vividly because I was so, so nervous. I worried that I wouldn’t like her for any number of nebulous, vague reasons, or that she and Davy would seem like a bad fit. But all of that worrying was for nothing. I loved her from the start and even better, I could tell that she loved Davy. He’s definitely a unique personality in many ways but every time I see them together, I’m reassured because she so totally gets him. I have loved seeing how much he clearly adores her. He has grown so much into a man (still baby brother, though) that I am incredibly proud of, and I know Rebekah deserves at least some of the credit. I normally try not to pry but it they had been together for a long time and I just couldn’t resist anymore so one day I asked Davy, “When are you going to marry that girl?” To my surprise he responded, “As soon as possible.” I was overjoyed to help pick out her engagement ring and help Davy plan a surprise proposal. Now we’re just a few weeks away from the wedding and though she has really been part of our family for some time it feels awesome to say, I’m finally getting a sister. 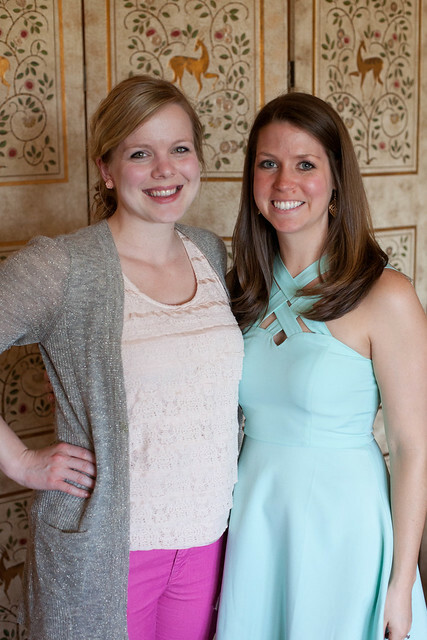 I was honored when Rebekah agreed to let me host a bridal shower for her friends and some family. Since our families are from Bloomington and many of her friends are still there, we decided that would be the best location for the shower. 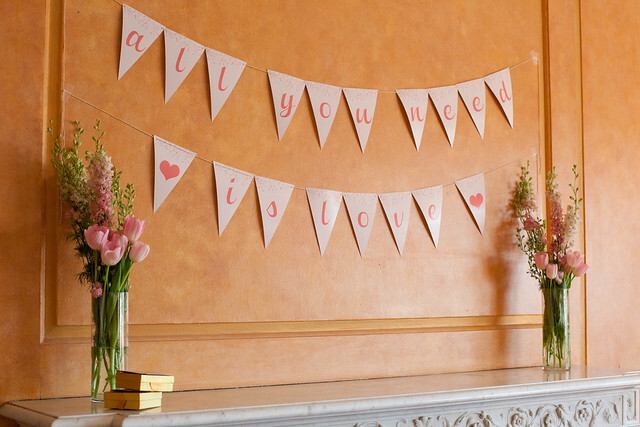 I pondered a few different venues for the shower and inquired at Deer Park Manor, a former mansion-turned-wedding and party space that seemed like it might work. I was delighted when the person responding to my inquiry was none other than my former Girl Scout leader Sue, now the event planner at the venue. I could not have asked for a better situation! I toured the venue and decided yes, it was exactly what I was hoping for. By the time all the details were worked out, I was already in a bit of a time crunch so my amazingly talented friend Courtney whipped up some invitations for me. 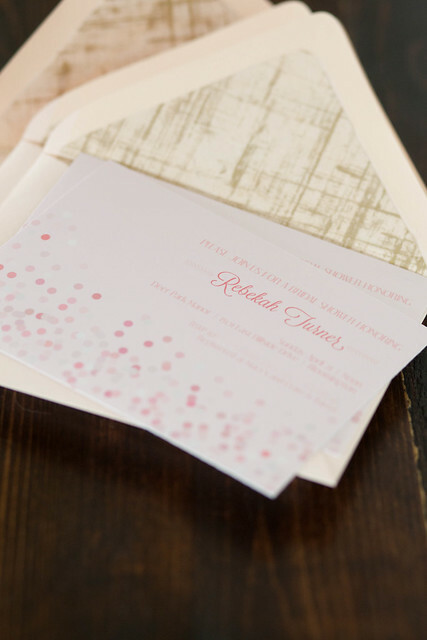 Rebekah had suggested a pink champagne sort of theme at some point along the way, so Courtney came up with this beautiful bubbly motif that was so perfect. Since this was a bridal shower and not a baby shower, a champagne bellini bar was totally appropriate and very, very much enjoyed! We had raspberry, blackberry, and peach puree available for making the bellinis. They were all great but the classic peach was definitely my favorite combination. 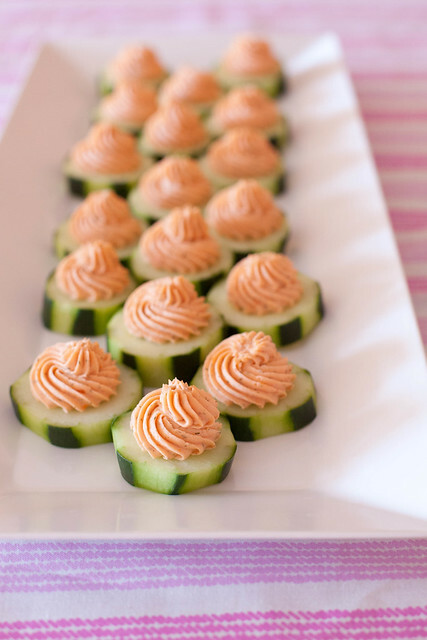 I also made sure to include a non-alcoholic option for the expectant moms in attendance. 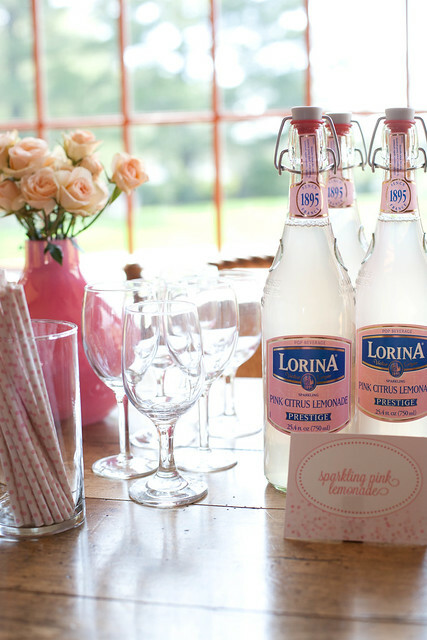 This sparkling pink lemonade has long been a favorite of mine and is every bit as fun as a cocktail, in my opinion. To help the girly up the room where the food was served, I floated two dozen balloons over the food table and cut the ribbons to an appropriate length. This added a nice festive touch and I think carried that bubbly theme through a bit more. 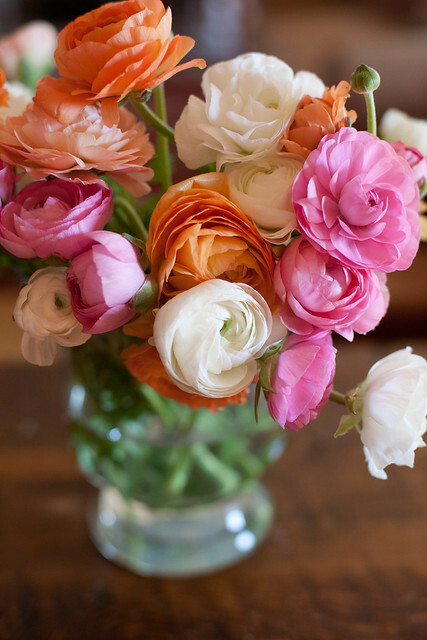 Can we just talk for one second about how gorgeous ranunculus is? I love the graceful swirls of the petals. I swear, I could just stare at them for hours! 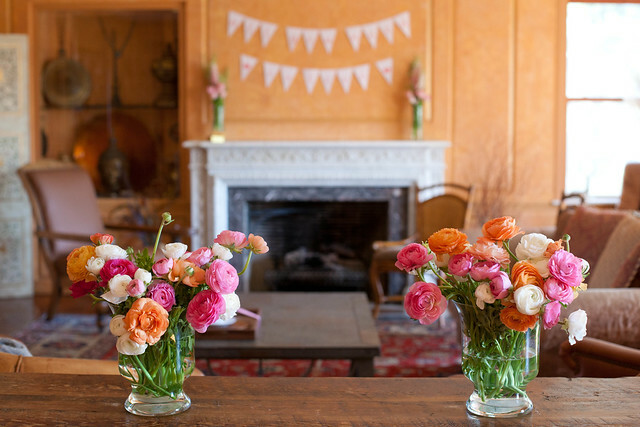 Also, a little entertaining tip – hurricane or other large candle holders also double spectacularly as vases. Don’t go buying new vases if you have good candle holders around. After we had all finished eating, we refilled our champagne glasses and then gathered round for some shower games. I try to keep these fairly short, sweet, and non-embarrassing for anyone involved. One game was a cooking knowledge quiz from a Hallmark book of bridal shower games from the late ’70s. It was actually fairly challenging! The next game is what is pictured above, The Price is Right. (I played this once at a shower and loved the idea so much, I had to use it myself.) 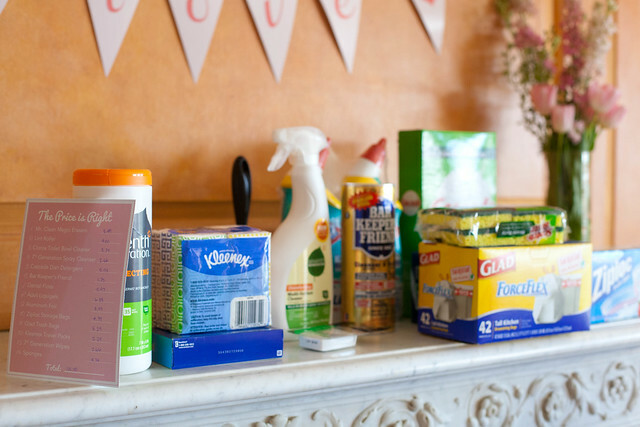 I bought a variety of household items for the bride and groom to keep – mostly cleaning supplies, headache medicine, dental floss, etc. Everyone writes down their guesses for the prices of the items (I also tell them what store the items were purchased at, since prices vary) and the person with the closest total price without going over wins! I am personally absolutely terrible at estimating things like this, so I was incredibly impressed with the winner. She came within about $1.50 of the total! Lastly, I had asked Davy 15 questions before the shower and I asked Rebekah the same 15 questions. For every answer they matched up, I gave them a $5 toward a date night out at a restaurant of their choosing. They did really well at about eight! Then Rebekah opened her gifts. 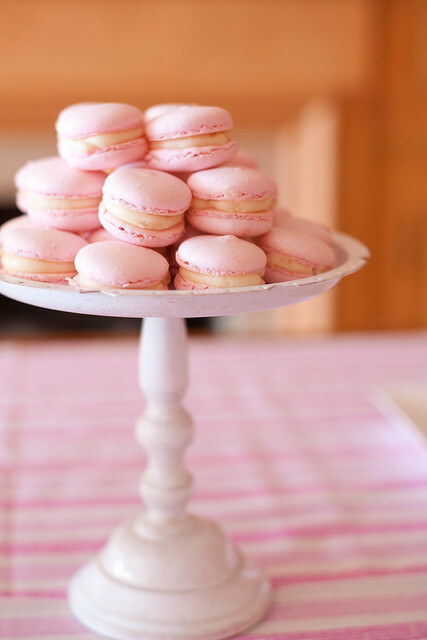 It’s always such fun to see brides getting fun equipment and dishes to stock their kitchens. Rebekah is a fantastic cook so I know all of it will be put to good use. After gifts, many guests lingered a while longer and we made sure to finish off the leftover champagne. 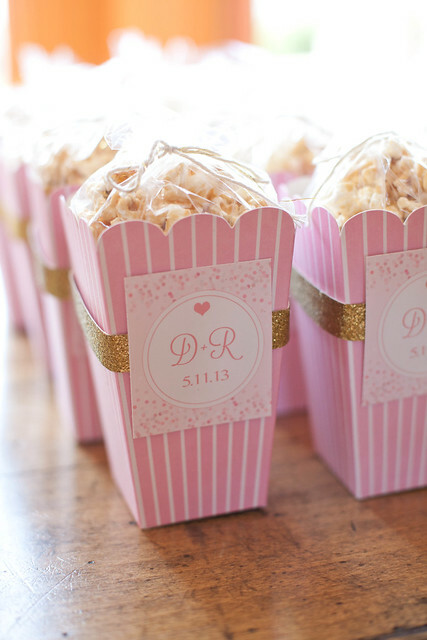 I had little boxes of caramel corn as favors, spruced up by some gold glitter ribbon, gold twine, and cute tags from Courtney. I was sad for the shower to end but it’s okay because in no time at all it will be the big wedding day! What a wonderful day that will be.